I had a baby while I was writing my second novel, and I think that influenced its development. It certainly meant it took me longer to finish it! In Your Light is a mystery for teens about a missing sister and a cult. 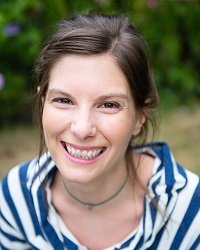 A lot of the edits were done late at night or very early in the morning as my little girl slept on my chest or in her cot next to me - so I was intensely aware of this new life I'd created, and how I wanted to talk to my child about the world as she grows up. The novel originally came to me in the form of two characters - one, a 16-year-old desperate to find her missing sister, and the other a young woman living in an all-female religious cult. And so it's probably not surprising that the book developed into a dual narrative, told partly from the perspective of Lil, whose heart was broken when her sister Mella disappeared four months earlier, and partly by Brilliance, a young Sister at a closed community known as The Sisterhood of the Light. The book is full of women, and it is the "sibling" relationships between Lil and Mella and the sisters at the cult that really drive the narrative. With my daughter in mind, I was eager to show positive but truthful female relationships and to have a book populated with inspiring but real (flawed) female characters. I also wanted to show women in roles where you might more traditionally expect to find a man, like a police officer and a cult leader. It is so vital for literature to feature empowered and aspirational women, and this is something I also look for in my "day job", as a commissioning editor for Walker Books. I feel very lucky to be both a writer and an editor, and I think I'm better at each job because of the other. Sometimes it can be hard to turn my "editor brain" off while writing, which is a bit frustrating, and I'm sure my editors have found me challenging to edit, because I am always editing myself as well! But ultimately, I love being surrounded, day and night, by books and inspirational writers and publishing professionals. I wouldn't have it any other way. I did a lot of research for this novel, including reaching out to the charity Missing People to understand better the complexities of loss. The work they do to support the missing and their families is truly inspiring, and what began as a half-hour research session turned into eight months' volunteering on their 24-hour helpline. Everything that happens in my novel is fiction and not based on real-life events, but the experience at Missing People was one of the hardest and most rewarding of my life. It really shaped the narrative. It is Lil's love for and determination to find her sister that is at the heart of my book, as is the fact that she ultimately has to accept that there will be things she'll never know about what has happened to her. And that's the other aspect of the novel for me - the idea that life can be messy and painful, but, as I hope the ending of In Your Light shows, it can also be beautiful and full of love and hope. It is certainly something I'd like to teach my daughter as she grows up. 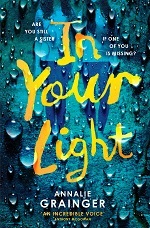 In Your Light by Annalie Grainger is out today (3 May) from Simon & Schuster Children's Books.